The APEC Workshop on Facing Abnormal Flood Disaster: New Vision for APEC Member Economies was organized by Vietnamese Government from 28 to 29 July 2011 at Life Style Resort Hotel in Da Nang, Vietnam. The workshop was attended by experts from APEC member economies as well as experts from international organizations. 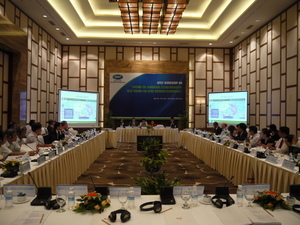 Invited by the Vietnamese Government, IRP/ADRC also participated in the Workshop. The Workshop addressed: a) Abnormal flood disasters in Asia-Pacific region and the experience of APEC economies in responding to such challenges; b) Best practices on emergency preparedness and response to abnormal flood disasters; c) New vision for APEC members in abnormal flood management. IRP/ADRC presented the experience and lessons learned from the Great East Japan Earthquake and Tsunami disaster. The presentation drew a lot of attention, specifically on how Japan - a developed country - organizes recovery activities.